NotesCooking for a Crowd?Kids Can! Preheat oven to 350 degrees. Prepare baking pans. If making a loaf, lightly spray or oil and flour a 9x5 bread pan. If making muffins, lightly oil or spray a muffin tin. Cook carrots until they are very soft. Fresh - Steam or boil. Frozen - Follow package directions or microwave, steam or boil. Canned - Rinse and drain. Bake bread for 50 minutes or muffins for 18 to 20 minutes, until a toothpick inserted in center comes out clean. 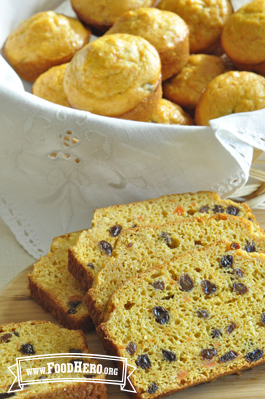 4 Comments for "Sweet Carrot Bread or Muffins"
Is there a good substitute for the egg in this recipe. Would applesauce work instead? We will do some testing and post another reply when we have results. This recipe was a huge hit! I made both muffins and bread using regular pancake mix and they turned out great. The muffins were all gone within a day! I had frozen carrots on hand so I steamed them in the microwave before mashing. I also added chopped almonds to the bread for a little crunch. Another great and easy Food Hero recipe! Everyone ate the perfect muffins up.... We made the muffins and used whole grain baking mix but want to try the Food Hero Master Mix next time. Oh and we had some currents in the cupboard and used those to mix in.